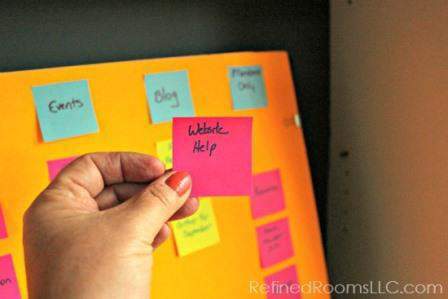 One of the mantras you’ll hear from professional organizers is that the key to overcoming that sense of overwhelm that you feel when faced with a large project (such as decluttering your space) is to break the project down into small, bite-sized action steps. Organizers are not immune to the experience of being overwhelmed by massive projects. We’ve simply mastered the art of “Break It Down”. They’ve developed specific methods for getting overwhelming projects done. There are a variety of methods that can be used to break a large project down, such as creating a master list or using a mind mapping tool. Today, I’d like to share one of my favorite methods that I began using way back in my graduate school days in order to complete my master’s thesis and Ph.D. dissertation. Just this past week, I used this method for creating a website from scratch for my NAPO Chapter. This method is simple…all it requires is a poster board, a Sharpie marker, and some Post-It Notes. I know, I know. Just last week, it seems as though I was dissing the Post It Note. In fact, I’m a huge fan of this organizing tool, just not when it’s used in the wrong way and ends up creating paper clutter. 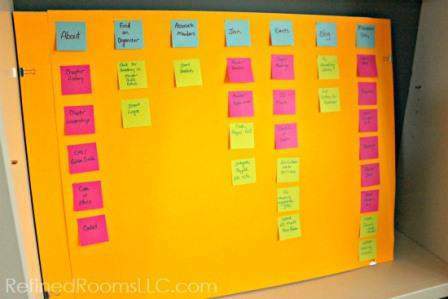 For large projects, I create a project board that lives on a bookcase in my home office until the project is completed. I incorporate lots of vibrant colors so that I cannot ignore the project board. Having this bright, colorful board displayed in a central location in my office serves as a constant reminder of the project, and combats my natural tendency to procrastinate (yes, I fight the Procrastination Demon as well!). I love to incorporate color-coding in my organizing methods whenever possible. Thankfully, Post-It notes have evolved beyond the original yellow notes. They make it easy to organize tasks using color. 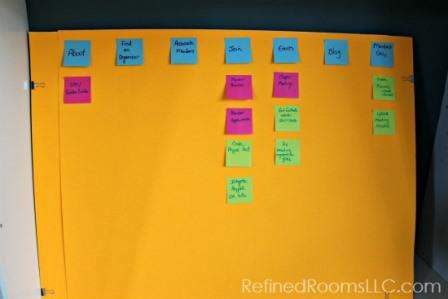 For my current website project, I used blue Post-It Notes to designate the various menu tabs on the site. I used pink Post-It Notes to designate sub-menu pages that needed to be created under the main menu tab. 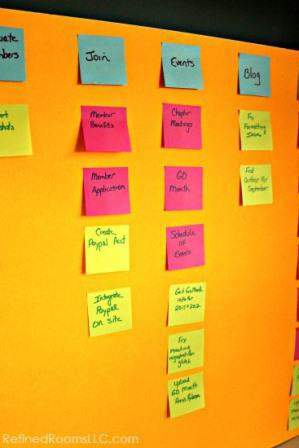 Yellow Post-It notes were used to identify smaller action steps associated with each tab in the website menu. For example, our chapter needed to create a Paypal account to accept online payments for membership applications. Each time I completed the action step associated with a Post-It Note, I removed that note from the board. If you get a natural high from crossing things off To Do lists, then you’ll understand the excitement I felt each time one of these notes went in the trash! This method gives me the ability to know what’s left on the project “To Do” list just by quickly scanning the board. The more notes that have been removed, the greater my motivation becomes to complete the remaining tasks in order to reach blank board “Xanadu”! 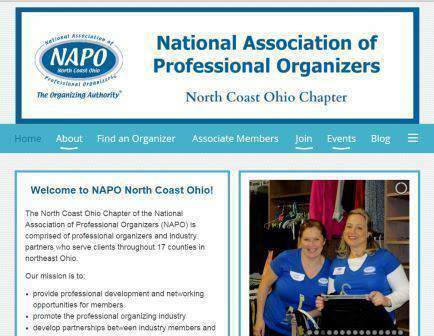 Voila…we have a new and improved website for NAPO North Coast Ohio! Do you have a large and scary project on the horizon? 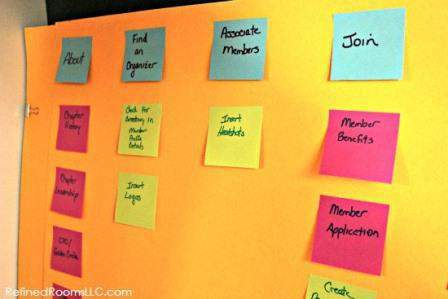 Why not give the Project Board method a try? If you do, leave a comment and let me know how it works for you! Here from Monday Madness, and just bouncing around looking at all your stuff that pertains to me! Okay, I’ll go ahead and subscribe already! Thanks so much for stopping by…and for subscribing. Glad you find the blog content useful! Thanks for the positive feedback, and THANK YOU for featuring the post on your link party! I appreciate it and will definitely drop by tomorrow to check out all of the other great posts. Thanks so much for your comment. 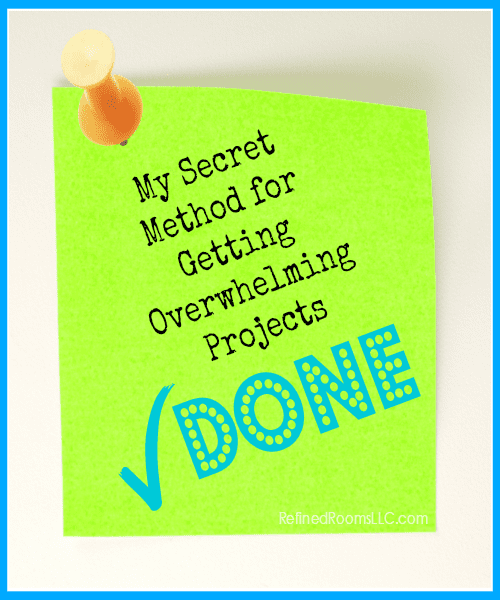 Come back and Let me know how the method helps you tackle those 3 projects! Great job on the website, Natalie!! 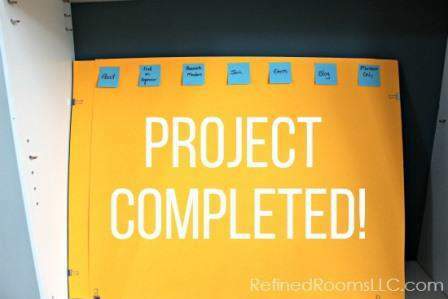 I really like the project board method and plan to use it in my office!! I’m so happy you find the method useful. Please let me know how it works for you!